Erase Piltdown from their dossiers, and you erase also whatever little fame Abbott, Butterfield, Dawson, Hewitt, Hinton, Sollas and Woodhead have today. Erase the episode from the dossiers of Teilhard de Chardin and Conan Doyle, and their fame would be intact. Grafton Elliot Smith, like all of those mentioned (except Conan Doyle), made important contributions to scientific knowledge. Like Sollas and Teilhard de Chardin, he was also a theorist. His name is no better known than that of any of the other suspects, but some of his theories set the dimensions of our understanding of where we came from. Smith enters the lineup because a few historians have selected him as the Piltdown hoaxer. It seems to me that the chance of Smith's being the Piltdown hoaxer is about the same as that of Butterfield's, that is, infinitesimal. He is of interest partly because he fell for the hoax and, of deeper injury to his reputation, because he obstinately continued advocacy of Piltdown Man in the period between the wars. His career as advocate well illustrates how addiction to theory can distort interpretation of evidence. that he is over fifty thousand. With this present chapter, the inquest rises from the Piltdown pit to the nobler cosmos of human ascent and diffusion over the earth. In The Piltdown Men (1972), Ronald Millar remarks that Woodward and Teilhard de Chardin are beyond the "shadow of suspicion merely because of their respective standings in Science and the Church. Another, who I firmly believe was the hoaxer, is never mentioned at all." Some hundred pages later, the book mentions Smith. Why did he do it? As a native Australian in the backwater outpost of Cairo, Smith needed something impressive for advancement in his profession. But his career shows just the opposite and justifies the word J. S. Weiner used about Millar's accusation that Smith needed "advancement through malpractice": "ridiculous." This is what Millar says of Oakley's reaction to the news that Smith was the Piltdown hoaxer: "The naming of Smith did not bring any objection from him. He raised his eye-brows. Indeed, Oakley thought that I could be right." This is what Oakley said of this eyebrow-raising conversation: Millar correctly reported the admiration Oakley had for Teilhard de Chardin, but "completely misrepresents me as supporting his absurd view that Elliot Smith might have perpetrated the Piltdown hoax" (Private communication, December 13, 1980). Darwin's The Descent of Man hit the stands in February 1871. Half a year later and halfway round the globe, in New South Wales, was born one Grafton Elliot Smith, whose destiny it would be to validate the Darwinian theory that human beings had developed from primate ancestors. In 1888, the year that a Melanesian mummy from Torres Straits was installed in the University of Sydney's Macleay Museum, young Grafton Elliot Smith enrolled. Seven years later, he was awarded the degree of Doctor of Medicine, his thesis being "On the Anatomy and Histology of the Non-placental Mammals," and a scholarship to England. When he arrived there, in June 1896, at the ripe age of 25, he had already authored a dozen papers on the brain and nervous system. The following year saw eight more of his papers published. A research assistantship at St. John's College, Cambridge, introduced him to teaching. In June 1897, he delivered a paper on the fornix to the Anatomical Society of Dublin; the  next month, he attended a British Association for the Advancement of Science meeting in Canada; in the summer, he visited Australia. The British Medical Association gave Smith a scholarship of 150 pounds renewable annually. In 1898, he read and admired a book that had just come out, Outlines of Vertebrate Palaeontology, by the assistant keeper of geology of the British Museum, Arthur Smith Woodward. In 1899, Smith took up a project already seventy-five years old, to catalogue the collection of brains at the Royal College of Surgeons-the catalogue completed and published three years later. He quickly became acquainted with all the major British and Irish anatomists, and had achieved so high a reputation in 1899 that the Government School of Medicine in Cairo, Egypt, invited him to take the post of professor of anatomy. In the nine years of his stay in Cairo, Smith published close to one-hundred papers. In 1907, the year the Royal Society elected him fellow, he published sixteen papers on dentition, the cortex, corpus callosum, asymmetry of brains, relationship of lemurs to apes; in 1908, twenty-two; 1909, twelve. That output was kept up throughout his life-for example, the years chosen at random, 1923, seventeen; 1926, twenty-two; 1932, fourteen. His professional career experienced no leaps. It's a record of steady achievement and recognition right from the beginning, when he and the Torres Straits mummy were freshmen at the University of Sydney, through his professorship at University College London, a record that includes the fact that his students fanned out over the world, many of them becoming famous in their fields, such as Raymond Dart, the discoverer of Australopithecus. As further evidence of Smith's culpability, Millar emphasized the way in which Piltdown Man satisfied Smith's theories on the evolution of culture and the evolution of primates. Smith began to work out the theory of cultural diffusion during his stay in Cairo. Millar speculated that the Piltdown skull could have come from Egyptian skeletons Smith anatomized. Malcolm Bowden also focuses on Smith's having taught in Cairo and on Smith's having had access to the hippopotamus and elephant molars that appeared in the pit, Malta and Tunisia just down the street. Furthermore, in that very city lived, at the very same time, Teilhard de Chardin. Bowden plays up this guilt-by-neighborhood, imagining that since Teillard and Smith were in Cairo at the same time they must have met; and, if they met, they must have conspired. Perhaps Teilhard gave that Tunisian radioactive tooth to Smith, who then did the dirty work of planting it years later. Bowden concedes that his identification is "far from adequate. Nevertheless, it would seem that, at the very least, Smith was well aware of the hoax being carried out at Piltdown, and indeed may well have been the instigator." But there is no reason to believe that, while he was at Cairo, Smith had special access to anything that turned up in the pit, fossils or Jesuit, or that he was aware of the hoax being tuned up in Sussex. During the nine years of his professorship at Cairo, from 1900 to 1909, Smith participated in an archaeological survey of Nubia. He brought to this assignment useful anatomical training, the task requiring examination of 20,000 skeletons. In addition to having a hoard of ancient Egyptian bodies to work on, he also worked on modern Egyptian medical students, organizing the medical school. In 1906, he wrote the first of many papers on mummification. His tour in Egypt introduced him not only to ancient techniques of mummification, but to the spread of those techniques throughout the world. 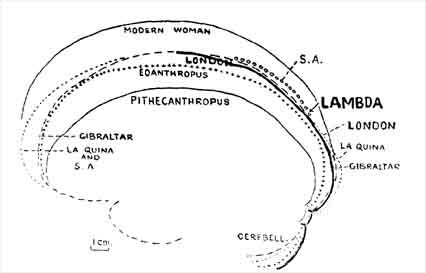 In his 1911 The Ancient Egyptians, he traced the diffusion of culture from Egypt, where civilization was born, to the coast of Spain, and then to Malta, Sardinia, Great Britain, and the South Pacific (see his "Conversion in Science" for a synopsis of his views). Not only mummification, but other cultural inventions, such as the building of megalithic monuments, spread over the world from the Egyptian source. Similarities among different cultures had come about not because of some innate human tendency to do certain things in certain ways but because all the cultures either carried the original germ from Egypt or got infected by Egyptian modes. He argued that as the new waves of culture spread from "somewhere in the Middle East" the exponents of the new learning so to speak, drove the more primitive occupants further out. A near-animal Piltdown Man as far west as Britain would lend admirable support to his view. The Torres Straits mummy also illustrated that theory. This classmate of his freshman days was let out for Smith's investigation on his 1914 visit to his homeland. It was as dried as a smoked herring. While examining it before an audience, he pointed out features of the technology of mummification, how the fingernails were attached with threads, a hole through the occipital for the removal of the brain, slits in the flank. The Melanesians had obviously imported ways of mummifying from the Egyptians. It seemed a tour de force, Smith apparently never before having seen the mummy and yet being so exact in knowing its lineaments. According to Ian Langham, it was all a deception. If Smith had not seen that mummy when both entered the University of Sydney, he surely had known of it in the literature. Why then the pose? He may have been showing off, playing to the audience. Or just joking around. Millar gives us a motive in addition to that of professional advancement for Smith's having executed the Piltdown hoax: "Smith would have loved a chuckle at the expense of what he thought, possibly correctly, was stick-in-the-mud paleontology and anatomy. Somehow the whole affair reeks of Smith." Richard de Mille noted of Smith that he was "a brilliant man of science given to playing mordant jokes on his colleagues." To this line of reasoning, or unreasoning, Glyn Daniel replied, "Stuff and nonsense." The Cairo position held attractions-a good salary, a good pension, a schedule of teaching from October to June, which allowed Smith to peregrinate over the planet in his vacation months, and opportunity to analyze thousands of Nubian skeletons. But he found the duties too arduous, working in the museum, teaching, administrating, participating in the Nubian survey, and when an offer came to him from England he accepted it readily, migrating to England from Egypt like some ancient caveman. To Millar, Smith plotted the Piltdown hoax before he left Egypt. With his wife (he slipped marriage in between his busy affairs), Smith went on holiday to Australia in 1902. In 1904, he attended a meeting of the International Commission of Neurologists in London; in 1906, a summer meeting of the Anatomical Society in Dublin; in 1907, the Society's Birmingham meeting. On these visits in 1907 and 1908, Millar assures us, Smith manufactured and planted the fraudulent fossils that he would then research and with which he could make his mark in professional science. "His tumultuous appearances in England coincide remarkably with the turn of events in Sussex." Weiner said that tying these events to the Piltdown history is "incredible." Millar vies with van Esbroeck for high honors in fiction. In 1909, he took the Chair of Anatomy at Victoria University in Manchester. In these first years in England, he worked out a theory of primate evolution: that the cerebrum developed from an appendage of the olfactory bulb in the lamprey to a center of visual impression in the reptile. This process of change from olfaction to vision, critical to the growth of the higher centers of the brain, he discussed further in an address he gave to the Anthropology Section of the BAAS meeting at Dundee. Although the paucity of evidence permitted all kinds of opinions on our pedigree, there was enough to sketch that pedigree tentatively over a period of a million years. One factor stood out for Smith as of unquestionable certainty: "The steady and uniform development of the brain," especially of the neopallium, a term Smith invented to label the prefrontal area in which impressions are not only received but recorded, the organ of associative memory (now called neocortex). He pictures the emergence from mammalian stock of the tree shrew, progenitor of prosimians, from which evolved the shrewder monkeys, then simian intermediaries leading down one conduit to the modern apes and down another to human beings. While the primates retained the generalized features of earlier mammals in, for example, their hands, they underwent specialization of the brain. Cerebral specialization came about through the insectivorous shrews launching into the trees. Terrestrial animals rely upon the sodden sense of smell for guidance to food, mates, and territory, and for recognition of enemies; but the sense of smell is less useful up in the branches. The small proto-primate looked down upon its terrestrial relatives and gave up keenness of olfaction for keenness of other senses, auditory and tactile as well as visual. The arboreal animals also had to be more agile, so there was a survival value in selection for a more efficient motor cortex  than that possessed by the land-lubbers. Smith selects the prefrontal neo-pallium as the structure responsible for these functions of seeing, hearing, touching, moving, and the associative network linking them. So what else is new? The reason this summary reads like a cliché is that Smith successfully worked it out and into the way we understand our development from tree shrew to suburbanite. On the next part of his theory, however, he was wrong. He thought that the brain crossed the line to humanness before erect posture and speech. He asked, in opposing those who claimed that erect posture preceded enlargement of the brain, Why didn't the gibbon, which can walk erect, become man? Gibbons walking erect could use their hands. But that did not happen because the gibbon brain had not undergone prior development. The brain made "skilled movements of the possible." And then a feedback mechanism went into action, the liberation of the hands opening the way for further cerebral complexity. Smith's sequence, then, has the brain developing, growing larger and more intricate in its circuitry, until a primitive neopallium was achieved, and from that came the more advanced brain of modern human beings. After enlargement and complexity of brain came humanness of postcranial anatomy. Smith discussed Pithecanthropus in his address to the Dundee BAAS. He didn't linger on the circumstance that Pithecanthropus fails to exemplify his sequence: its post-cranial anatomy is more humanlike than its cranium. It was in the paper summarized above, the address at Dundee, as Smith would later boast and as Malcolm Bowden and Ronald Millar and Chapter 2 of this inquest remind us, that Grafton Elliot Smith predicted just such a being as Piltdown Man. The discovery of Piltdown Man satisfied Smith's theory, but upset hopes for a consistent sequence. 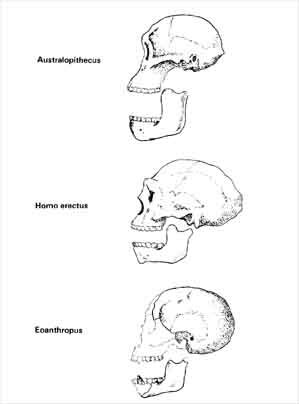 The humanlike Java pithecanthropine femur and jaw should have been found in association with the humanlike Sussex skull; and the apelike Java skull with the apelike Sussex jaw. Yet Piltdown Man's brain, which Smith estimated at 1,070 cc, and prominent prefrontal or neopallium region, in tandem with an ape jaw fit Smith's theory to a tee-for trouble. I do not know whether you have heard that a very early (pre-Heidelberg, said to be Pliocene) skull has been found in England and 1 want to be able to compare the brain cast with your La Quina cast next week. How often Smith visited the pit no one knows, though it is known that on one occasion his student Davidson Black found a fragment of rhinoceros tooth. Smith lived in Manchester, 250 miles from Piltdown, and did make a couple of visits in 1917. A few secret visits would have been enough for planting, and of course he would have known all about chemical staining and index fossils. But he certainly lacked the high degree of incompetence required to do the anatomical forgery. He also lacked a credible motive. Smith's contribution to the creature was not in finding fossils, but in analyzing cranium and brain. He did so in August 1913 and then constructed a brain-cast, producing a replica of Eoanthropus's big (but not too big) brain. The first of his twenty-year barrage of notes, articles, and books on Piltdown Man, entitled "Preliminary Report on the Cranial Cast," appeared in the 1913 Quarterly Journal of the Geological Society. Here Smith complimented the Piltdown brain as being the most primitive and simian ever recorded, a fit companion for that fetching ape jaw. While skeptical anthropologists stressed the humanness of the brain lurking in that cranium, and the apeness of the jaw bone, Smith chose to stress the apeness of the brain and the humanness of the jaw bone, repeatedly, over twenty years. In actual number of pages, Arthur Keith wrote more on Piltdown Man than anyone else; Smith wrote more papers than anyone else, many of those during his debate with Keith over the proper reconstruction of the skull. Smith's theory would accommodate better a brain of about 1,000 cc than Keith's bigger-brained reconstruction. Smith upheld the Woodward-Barlow model, which pleased Dawson no end. The cranial cast article was followed by a note in Nature (October 2, 1913), "The Piltdown Skull." Though his full report was in process, he wanted to discuss the skull right away because of "present widespread misunderstandings" about Dawson's great discovery. Dawn Man is a primitive and generalized type, with some features like those of an ape, others more like those of a human being's than are the features of the Neanderthalers. It would be proper to fit out Piltdown Man's jaw with a set of large canines (Teilhard had found the canine four weeks earlier). Just as a young child uses his teeth to snap at a disagreeable parent, so in the dawn of human existence, primitive people used their teeth for  offensive purposes long before the brain had crossed the line. The next few weeks saw more articles in Nature, in Man, in other periodicals, lectures to the Literary and Philosophical Society of Manchester, to the Royal Society, and elsewhere. Smith used Pycraft as a weapon, as Sollas did, to attack that American barbarian, Gerrit Miller. In 1924, Piltdown appears in Smith's Evolution of Man; in the second edition, 1927, the space increased from the original four pages to fourteen. Smith was tenacious. Far from loosening his adherence to Piltdown Man, the newly dug up hominids, the pithecanthropines and australopithecines, tightened it. The last stories of our inquest relate the way in which a skull found in Australia was taken as confirmation of fossils found in England; and the way in which historians have used this skull to incriminate Grafton Elliot Smith. In reality, the skull confirms neither Piltdown Man's authenticity nor Smith's criminality. Eighteen eighty-six was a wet year in Australia. A farmhand, Australian counterpart of Venus Hargreaves and Alfred Thorpe, laboring in the region of Talgai, spotted a cranium peeping out at him in a gully washed by the rains. He copped it, and it eventually ended up in the hands of a New South Wales auctioneer, Earnest H. K. Crawford. The relic consisted of a thick-boned human skull and jaw with large teeth, the largest human teeth ever found in a fossil. Hoping he was on to a good thing, Crawford offered it for sale to the Australian Museum and to the British Museum of Natural History. Now, from 1892 to 1901, the assistant keeper of geology at the British Museum, and from 1901 on the keeper, was one Arthur Smith Woodward. The Australian connection becomes complex: Woodward had collaborated on an article with Robert Etheridge, Jr. This article described fossil fish from Queensland, Australia. Crawford communicated with Etheridge on the sale of the Talgai skull. He also sent a photograph. The British Museum didn't reply. It's Crawford to Etheridge to Woodward so far, and from Woodward to the Piltdown pit is a fast snap. Woodward blocked Etheridge from replying because (according to this fantasy), it was too early to have the Talgai skull confirm Piltdown Man since Piltdown Man was only a conception, not yet born. Meanwhile, something equally suspicious was going on with Smith. In the summer of 1897, Smith visited Australia. He must have been aware  of the Talgai skull. Yet he did not mention it in his letters back home. Of two surviving letters from September 1896 to February 1897, one "has had its concluding section torn away" (Langham, "Talgai and Piltdown," 1979). Perhaps that concluding section had harbored a discussion of the skull, and it was later ripped off as part of Talgaigate. In 1902, Smith undertook what Ian Langham terms a "hush-hush" visit to Australia. Maybe he returned there for a covert investigation of the skull, which he planned to use as a prototype for the coming hoax in Sussex-its thick bones and apelike dentition would be a suitable model. I've already detailed the carelessness of the hoaxer in so filing the molars that their surfaces fail to align. But maybe he wasn't careless at all-Australian aborigine molars naturally exhibit the same misalignment of surfaces. The Piltdown cranium may have been that of an Australian aborigine-the Talgai skull is; and the Piltdown molars may have been modeled on the Talgai choppers. New finds and Eoanthropus. Eoanthropus became increasingly anomalous as the new australopithecine finds (such as A. africanus ) and pithecanthropine (Homo erectus ) were slotted into the human family. These new finds possessed a jaw more humanlike than the eoanthropicine under a skull less humanlike. Piltdown finds and of his (incorrect) conclusion that the pithecanthropine jaw was even more primitive than the eoanthropine. He imagined the Piltdowner's life to have been like that of the Tasmanians, more recently extinct; reestablished his priority via the Dundee address in predicting what a Piltdown Man would look like; and summarized how and where Egyptian customs spread throughout the world, all this enveloped in his theory that the brain came first. It was time to bring the Talgai skull, which Woodward and Smith had collaboratively shelved, out of the closet. The Talgai skull demonstrated its value upon presentation to the Anthropology Section of the BAAS meeting in Sydney on August 21. Langham tells us that nearly two hundred papers were delivered at that meeting, but the one on the Talgai skull stole the show. Piltdown was on everyone's mind. Smith, in a lecture at the Sydney Town Hall, drew the obvious moral: "The finding of the Talgai skull, with its great dog teeth" put to rest any doubts lingering about Piltdown Man. Through his brother, S. A. Smith, also an anatomist, G.E. put a value of 150 pounds on the skull and induced an affluent Australian to buy it for the Macleay Museum, where it could keep the Torres Straits mummy company. S.A. ranked the skull in importance with Piltdown. The brothers Smith enjoyed a family rapport in using both skulls as evidence that the brain led the way. Back in England, Dawson innocently observed that the pattern of Talgai tooth wear might support that of Piltdown dentition. The Piltdown genus had sent envoys to two widely separated parts of the earth, Talgai and Sussex. Grafton Elliot Smith gave an illustrated lecture on it in February 1915, to the Manchester Literary and Philosophical Society; read his brother S.A.'s descriptive paper the next year to the Royal Society; and in 1917 exhibited the skull from down under to the Geological Society in Piccadilly. Once, when Dawson asked Smith just where the Talgai skull had been exhumed, Smith replied that it had come from a village called Pilton. Millar used that anecdote as further evidence that Smith had a rich sense of humor. You see, said Millar, there isn't any place in Australia called Pilton. Langham looked at a map and found the Australian village of Pilton, sixteen miles from the site where the skull had been uncovered by the rains of 1886. To support an incrimination with a homonym, as Millar does, is unique in the Piltdown archives. On one of our coffee breaks in June 1984, I asked Ian Langham if he still thought Smith the hoaxer; he laughed and said no, he had chosen someone else. He wouldn't tell me who. 1 have given his views from his 1979 paper not to make fun of him, but because 1 think it's a pleasant  story with details about Smith's life and work that can be found nowhere else. Our conversation took place two months before his death in an accident in Sydney. Smith's was a total system, an integration of physical and cultural evolution. His fondness for Piltdown Man detracts from his good work in tracing out the evolution of mentality from invertebrates through monkeys to, the concluding subject of this inquest, philosophers.